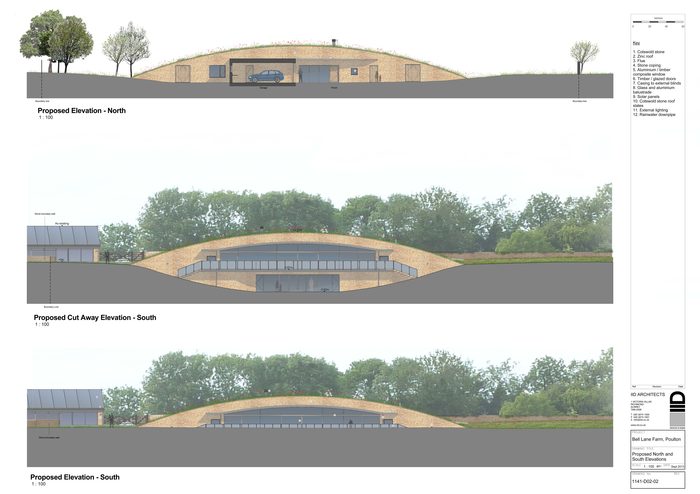 We have been following Alex's Long Barrow Passivhaus project in The Hub and on the podcast since it went through the planning stages. 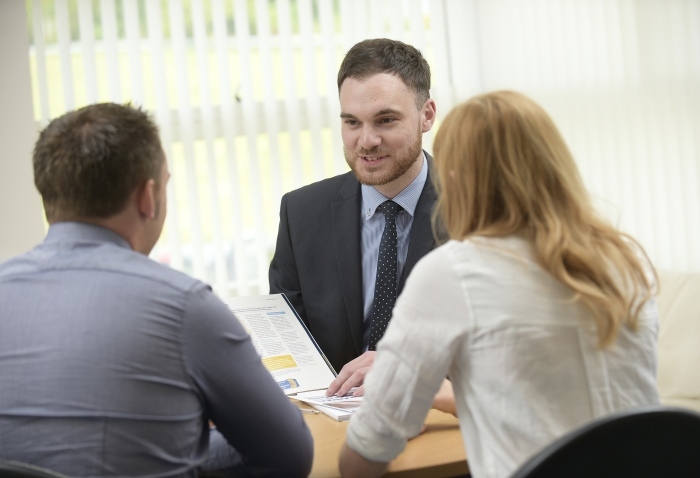 When we last caught up with Alex his employment status had recently changed and he was unable to secure a mortgage to complete the build. It's been two and a half years since then and work has finally resumed and progress is being made. 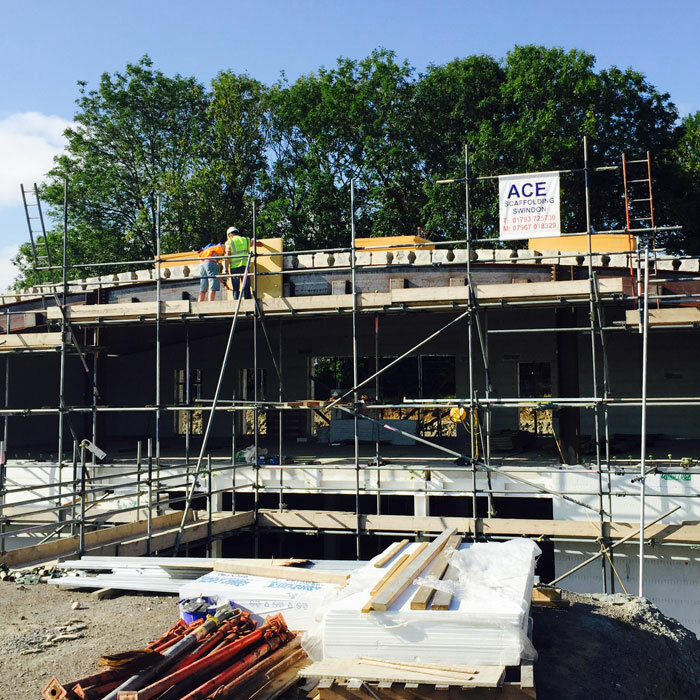 Alex has used insulated concrete form to create the main structure of the building. Whether this was the right choice he will reserve judgment on until they have completed the airtightness test. 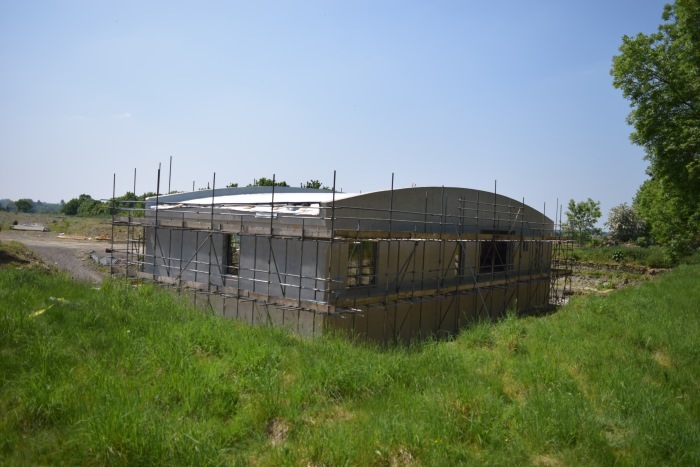 It has however been excellent in terms of the construction job it has done and how well it has stood up to the elements with no degradation at all in the two years that the site has effectively been closed. Had it been constructed from timber Alex would have been concerned about leaving it open and exposed for that length of time. 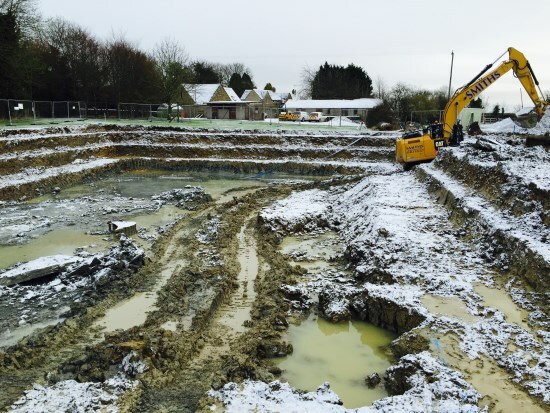 A complication with the excavations and additional costs that caused meant that they didn't have the funds available to complete the airtight and watertight stage. 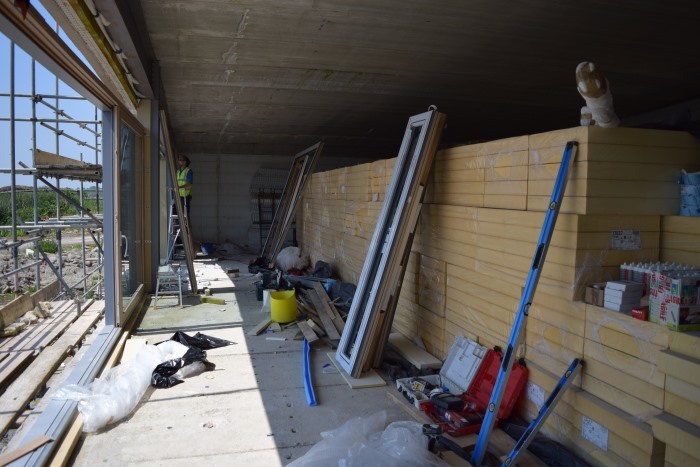 So instead they stopped before putting the windows in and render on, knowing that leaving either of those only partially complete would leave the internal timber window frame at risk of water damage. Because they had the money to complete various sections, they didn't leave anything halfway through and ensured they they stuck to their finite stop points. They went through a checklist with the builder to sign-off on the items to show which parts of the contract were or weren't complete. The JCT contract they had in place covered completion, quality and cost, and very little about timing as Alex knew that was the one thing he was prepared to compromise on if necessary. 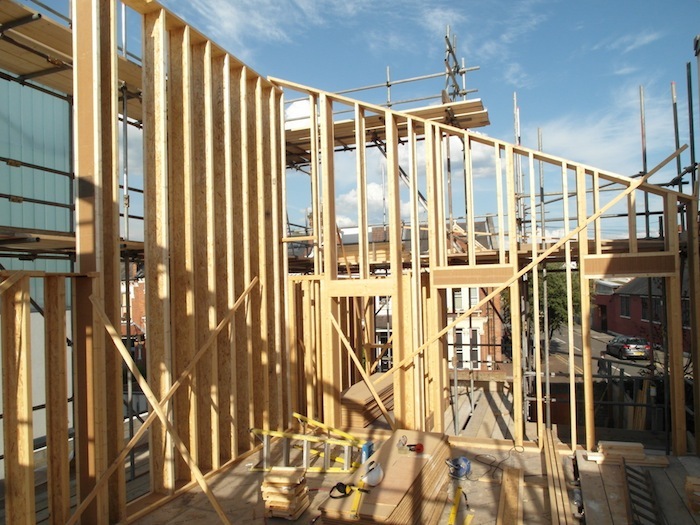 The builders were contracted to finish the job, so the pause happened between specific contract items, with the next item only being started when they were invited back on site. One extra cost they incurred was the scaffolding. 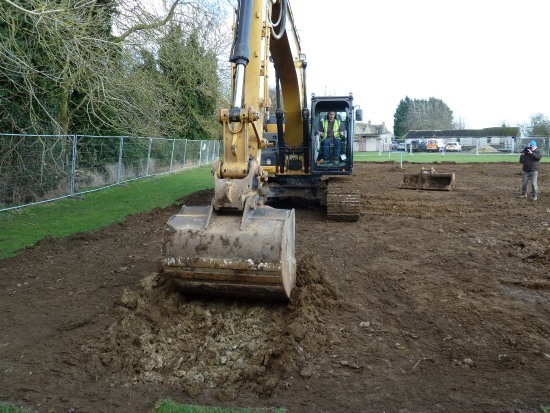 It stayed on site for four months, with Alex expecting work to have resumed in that time, so when it didn't he had to pay for that additional time, plus the extra costs of setting it all up again when they restarted. In the meantime, Alex has still had the additional costs of paying for rent, site insurance and third party liability insurance. 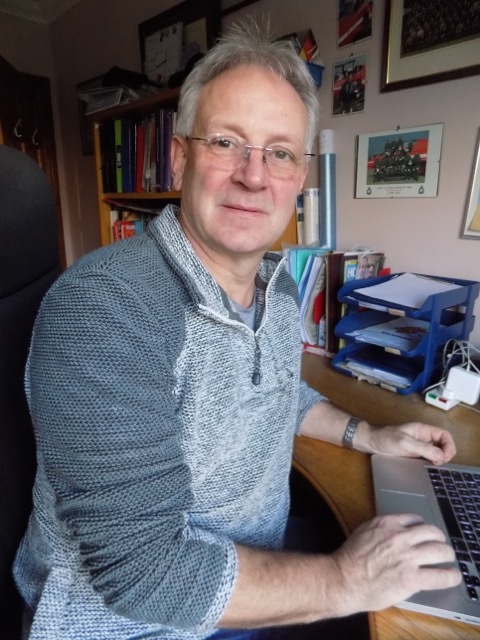 Alex has had financial assistance from his parents to get the project moving again, who have taken out mortgages on their property to fund it through to completion, with Alex taking out a mortgage at a certain stage to pay them back. This has meant that there have been emotional strains for the wider family being stakeholders, as well as for Alex, his wife and children. During the period of cessation, Alex has been focused on professional life, family life and getting the money to do the build. He has held back from pursuing contracts with utility companies etc, as these often only have 90 days on them. 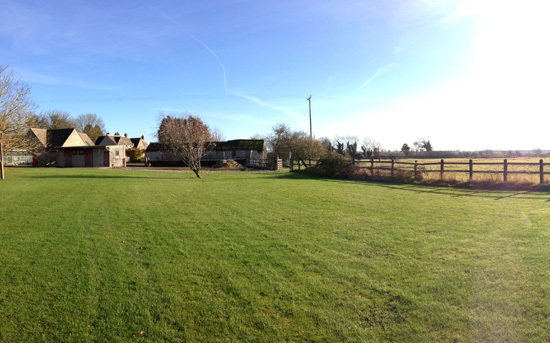 Getting the project restarted and back on site has been a painful and lengthy process. In July 2016, six or seven months after they had put the project on hold, they had finance in place and invited the contractors to return. After several months of not being able to get answers about when they would re-start, they were contacted to say the company was being closed down by their parent company. They were trying to get out of the contract but Alex knew the parent company would still have to honour and complete the contract, even if the team that were doing the building and the company responsible for it were no longer operating. 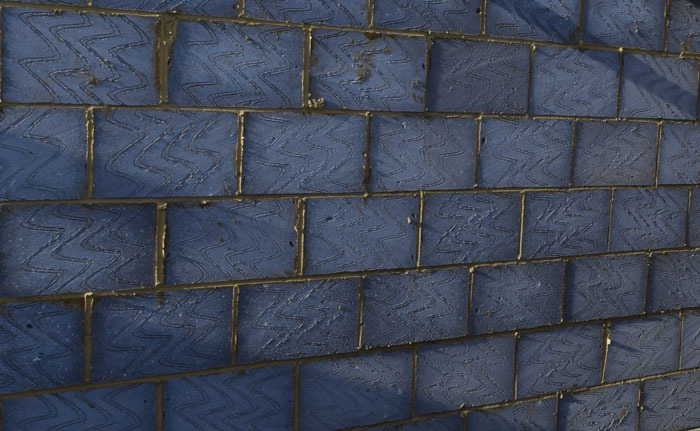 It has taken until the summer of 2017 to finally get work restarted. 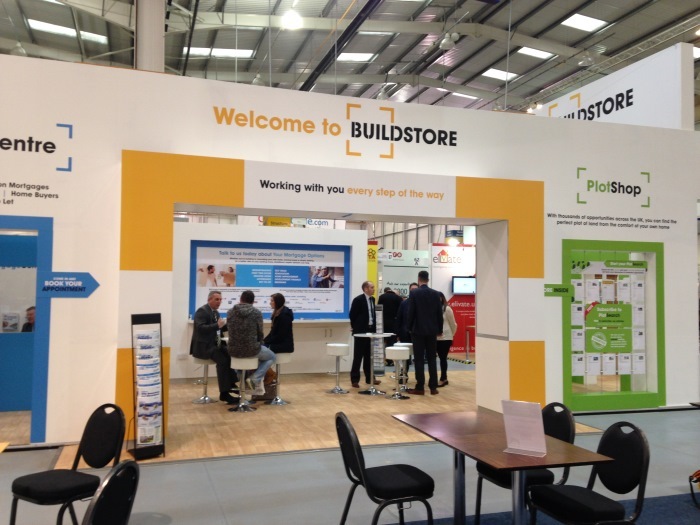 Fortunately they were able to re-hire the original site manager, but the company that closed didn't leave any of its data with the parent company, so the current team are having difficulties finding their way without the original details. 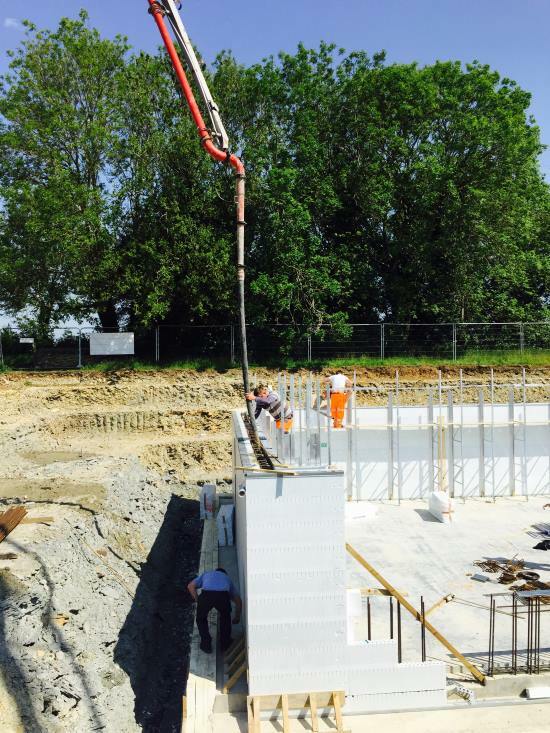 When the contractors finally returned to site they reviewed the waterproofing of the building. Being below the water table means that's a detail they need to get right, and they discovered that their original plan wasn't robust enough. This was discovered when the same method on another site failed over a period of time. 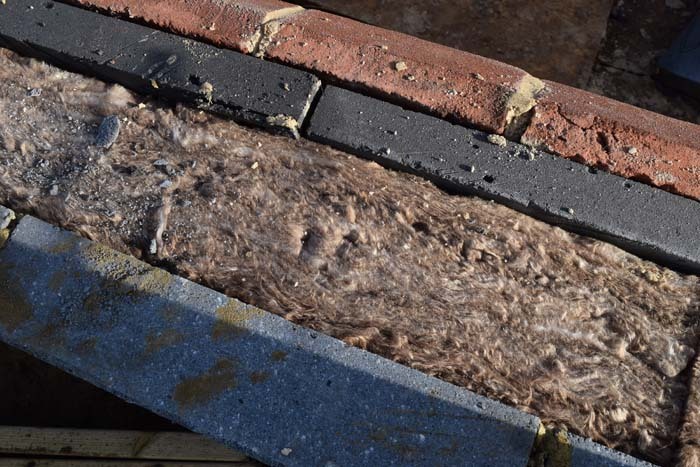 There had been some damage during the previous winter, where the pumps and electricity on site had stopped, and had ripped off part of the external waterproofing. 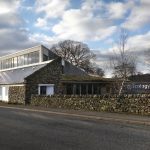 Progress has been incredibly slow in getting that remedied and Alex had been keen to get the render and waterproofing details confirmed so he could order the windows. 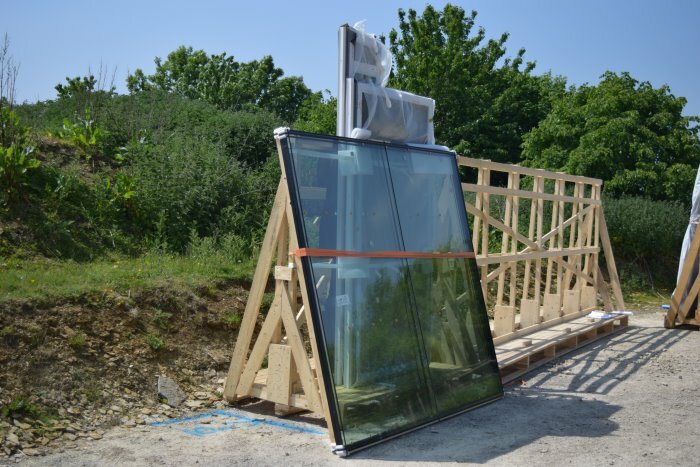 The contractors have struggled to find the right team to render the building but with an 8-12 week lead time on the windows he decided to order them anyway. 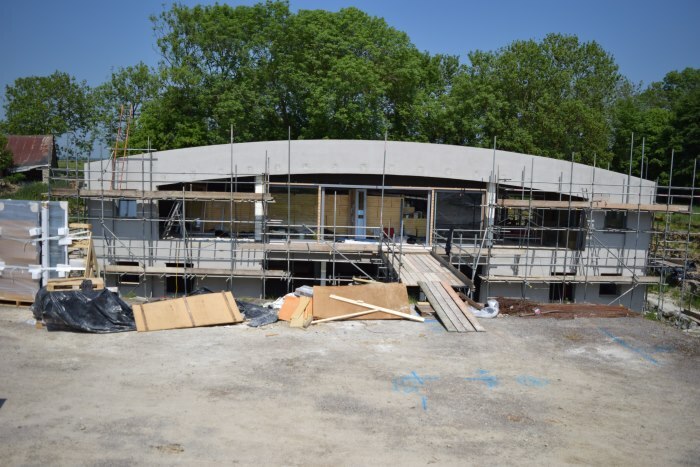 As of May 2018 there has been a recent flurry of activity with the base-coat rendering finished and the windows being installed. First on Alex's long list of tasks is to get the ventilation system organised. He is still waiting on the final waterproofing detail before he can get the landscape contractors to do the backfill. Following that will be ordering the utilities, which come into the house at above head height on the below ground floor. 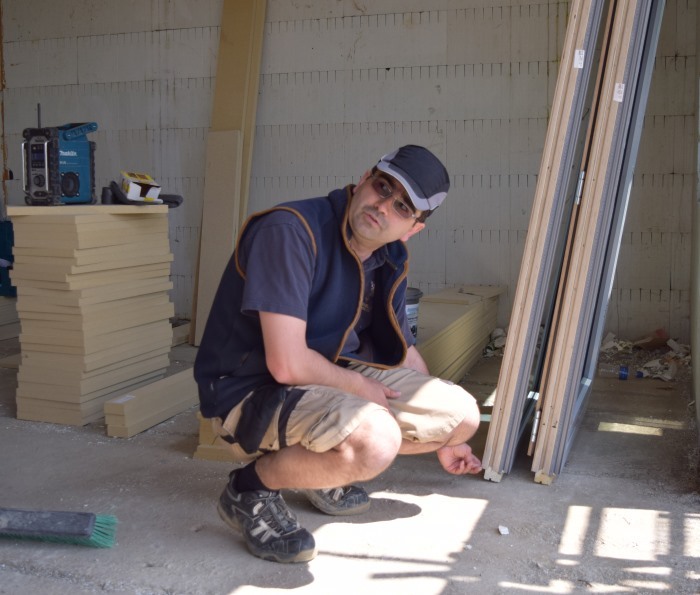 Alex is hoping that his finance will cover, at a minimum, a certain amount of first fix upstairs, get a bathroom in place, ventilation system installed and an operating kitchen, to make it a usable building. It has been an emotional roller coaster of a journey! Spirits are currently high with the previous week of activity making tangible differences to the aesthetics and fabric of the house. While the last couple of years have been challenging and caused a bit of love loss for the building, Alex remains thankful that they still love the location. 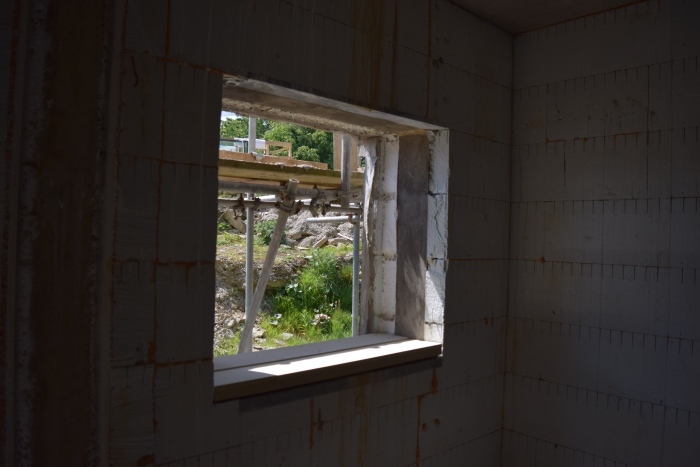 He is hopeful that once the building is finished they will be able to leave the negative thoughts behind as being part of the methodology and the process. 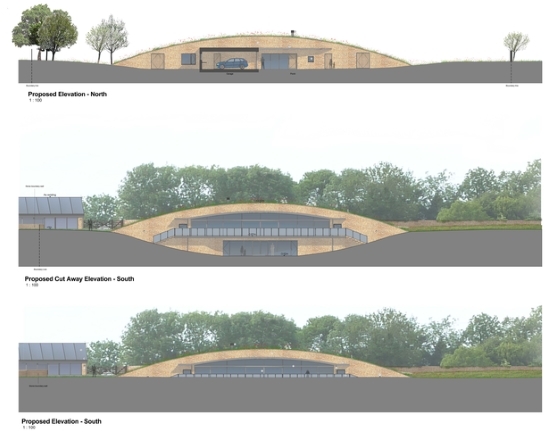 Listen to our previous podcasts with Alex – “How a public consultation helped a rural self build” and “Constructing Long Barrow Passivhaus”. 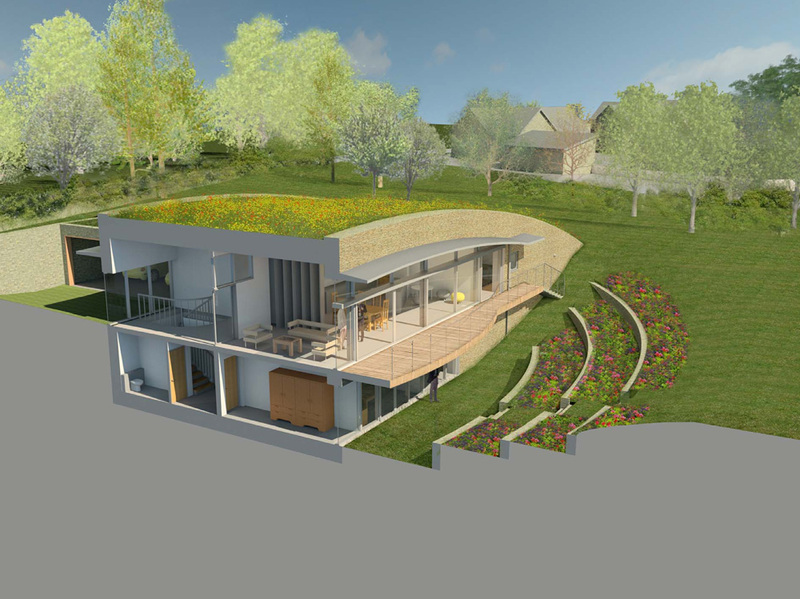 Alex Baines talks through the plans for his semi earth-sheltered home, to be constructed to Passivhaus standard, and explains why involving the local community in the early stages was essential in gaining the relevant permissions. 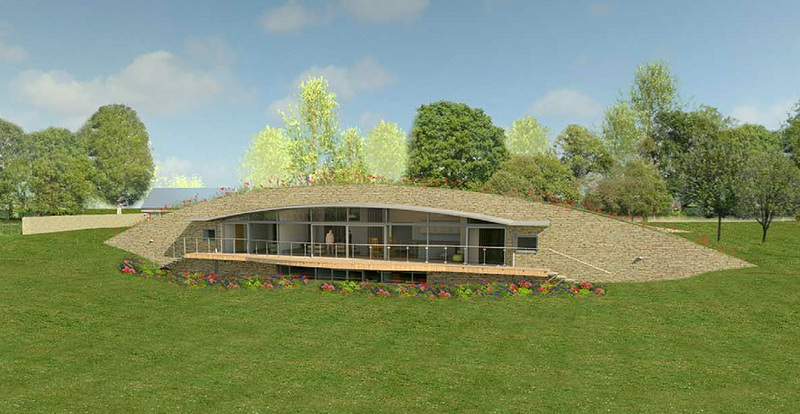 Alex Baines' new home Long Barrow is going to be a contemporary design but with traditional materials. It has had a lot of input from the surrounding community, which Alex's wife Louise grew up in and where Alex's mother currently lives. This is also a project we will be following at House Planning Help. Given the planning restrictions in place at the site, Alex knew that it was going to be important to have the support of the locals. 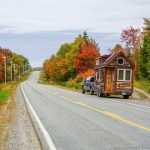 With their intention to settle in the location that was already special to their family, they also didn’t want to cause annoyance or be ostracized for creating something that was going to be upsetting to their neighbours. 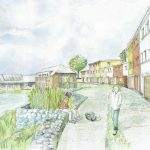 By using an iterative process of developing the design based on feedback from the public consultations, they were able to present the planners with a design which had a vast amount of local support. Alex credits this as being the reason they were given planning approval, even though the planning regulations in that particular area were against it. By asking people to be more specific about the elements they did and didn’t like, the final design has evolved to be contemporary in form and traditional in the materials used. The quantity and positioning of the glazing was also selected partly in order to minimise the visual impact on the areas that people can see it from. Alex likes being experimental and finding new ways of doing things, so gave the juniors the chance to create some original sketches, based literally only on the location and the number of rooms, almost as a type of work experience for them. By offering multiple options, people were able to point to elements that they didn’t like, and also ones that they did. Towards the end of the process the comments were quite specific, and they were taken on board to produce the final design, which actually ended up being a much cheaper and simpler concept. 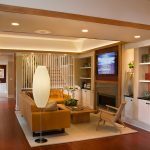 The family had fairly simple requirements of what they needed from the building, and it came down to the functionality of room functions and sizes. Together with the standard rooms they wanted a boot room, for stopping the spread into the rest of the building of muddy dogs and children! Alex works as a Passivhaus consultant so achieving Passivhaus certification was also something that was fundamental to the project. He was able to explain the ecological principles to the locals who were very supportive of the concept, and worked to fit them into the design. 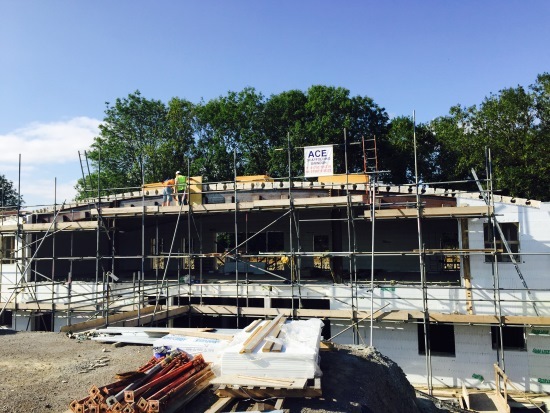 It was important for Alex to create something that has longevity and will last for hundreds of years, which is the reason why he will be using ICF for the floor and shell. 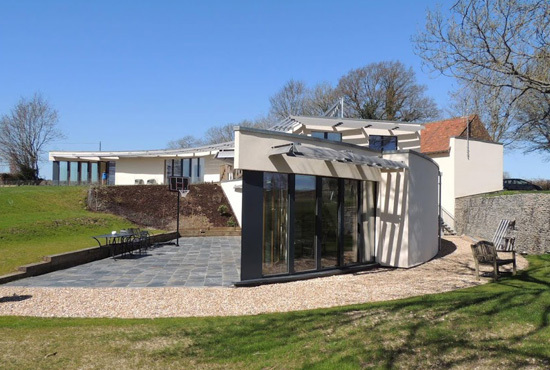 As the external design will not easily accommodate any extensions, he has ensured that the interior has a completely clear span so that any future generations living in the property can adapt the space to their needs. 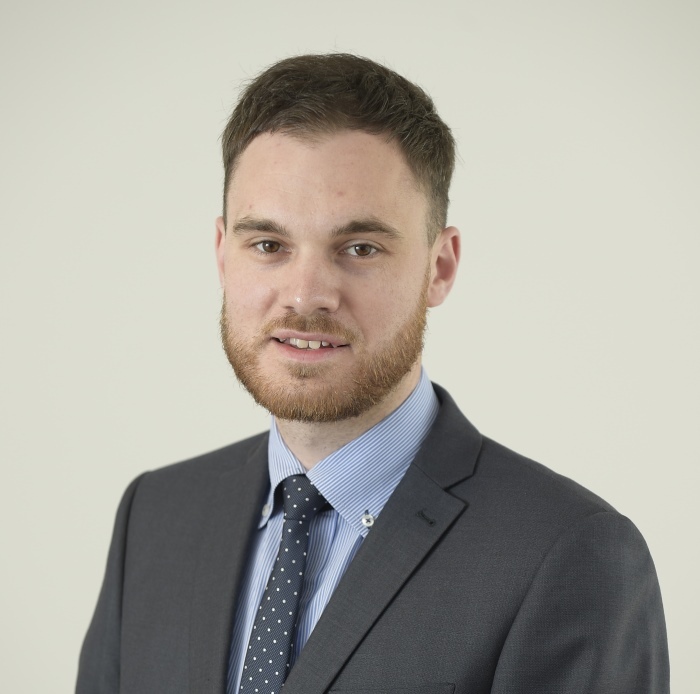 From a professional point of view, Alex is also interested in researching the properties of the ICF and seeing how it performs over the year. 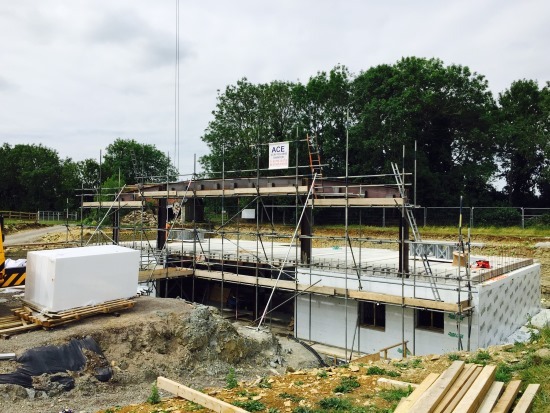 The first part of the build is being managed by the ICF manufacturer. Their contract is to manage and deliver the shell of the building. 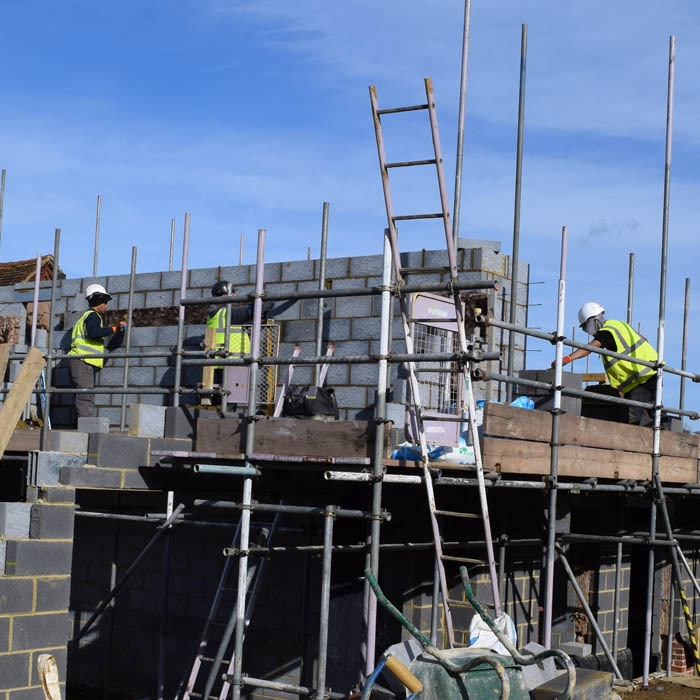 Once that has been handed over, Alex can continue with the management of the local tradespeople before his wife is able to concentrate on finishing the interior. 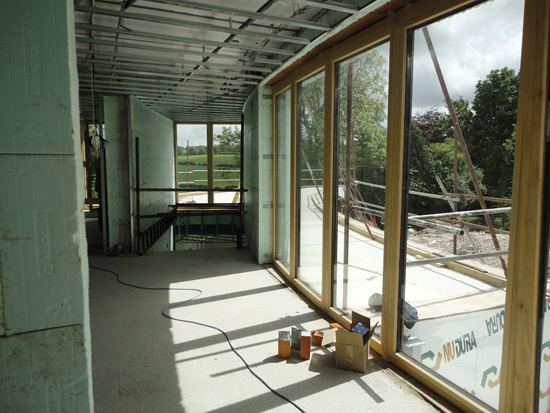 They don’t have to worry too much about airtightness with this system and the insulation is effectively already built in, really only leaving the windows to focus on. 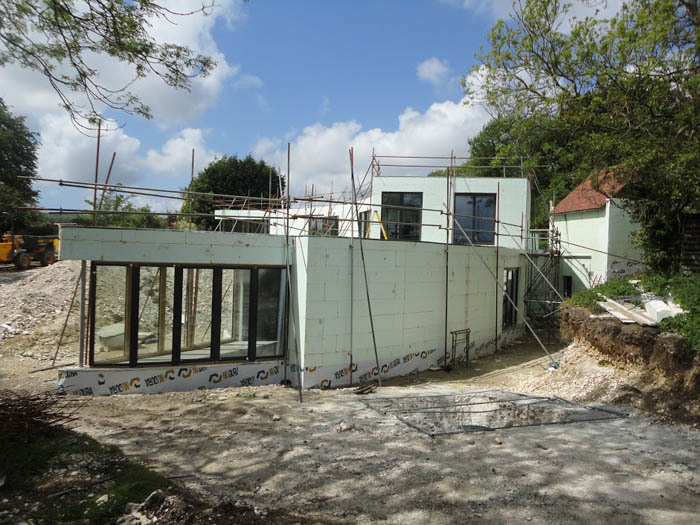 Although it may be slightly more expensive in ICF because the price of the material, and therefore that part of the build, is known they should be able to stick more closely to their budget. With the whole basement level being underground there was a worry that the rear of the building was not going to get enough natural light. Adding space for a lift was in their plans and by changing the designs to widen the stairs they have created a space where the stairs can wrap around a lift, when the time should come that they wish to add one. In the meantime, the extra space has created a lightwell down through the stair core into the back of the house, meaning it hasn’t been as much of a problem as they thought it might be. Regen Media has recently completed this video for Green Building Store. 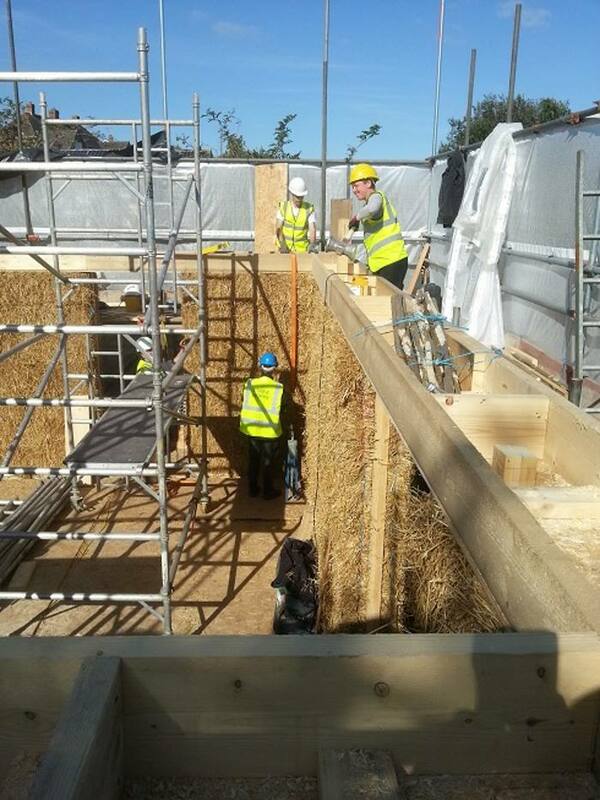 It explains all about a low energy retrofit that they have carried out at Stirley Community Farm. 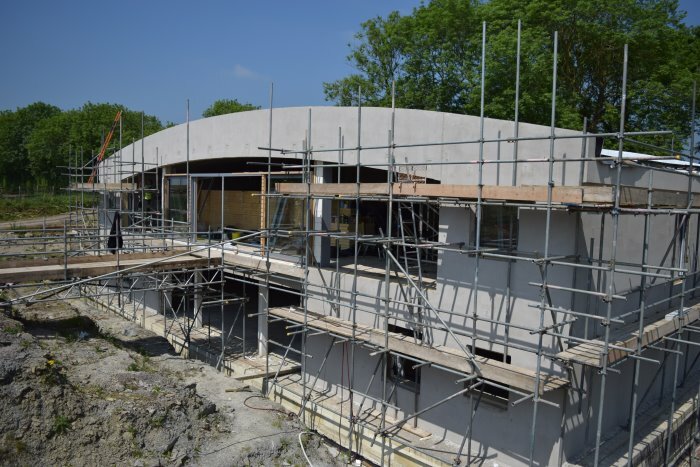 Jake White from Ecotecture shares the story of The Curly House, an award-winning project that was built using insulated concrete forms (ICF). He explains what an ICF is, why there are benefits in terms of speed of construction and durability, and why most concrete structures have the potential to be extremely airtight. 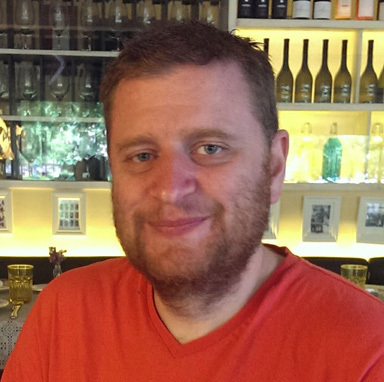 Jake White has been a director at Ecotecture for 10 years now. 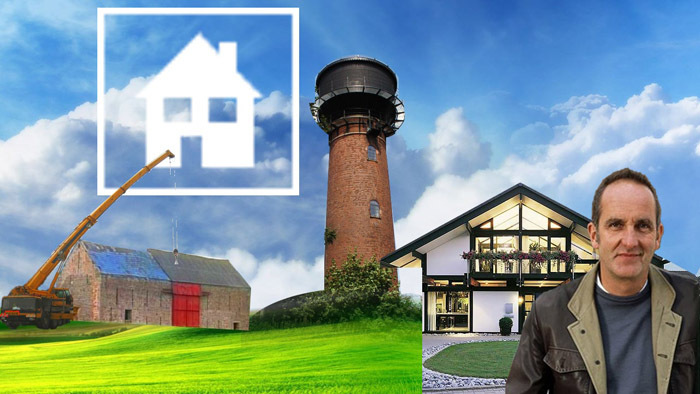 His interest in low energy buildings and sustainable design was brought about by a desire for improvement, having seen how bad the quality of workmanship and lack of understanding was in the “house bashing” industry. The manufacture of concrete and the resultant CO2 emissions often give it a bad reputation. Jake feels that given its durable, dense, long-lasting structure, this should not be the case for buildings that are designed to last generations. 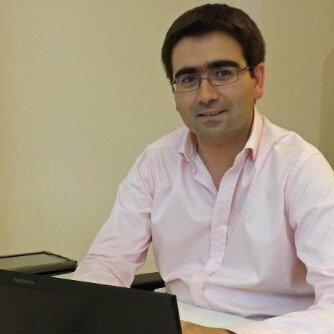 In producing buildings of this quality he is disconnecting his clients from the effects of fuel hikes and fuel poverty. 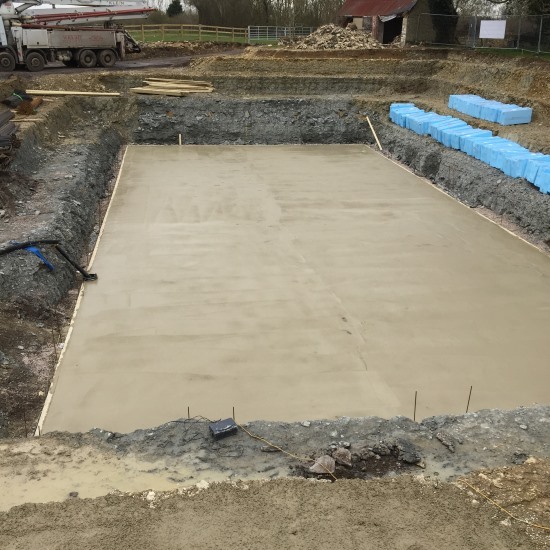 Traditionally the thermal mass of concrete has always been exposed so it will re-emit the heat at night time that has been absorbed during the day. 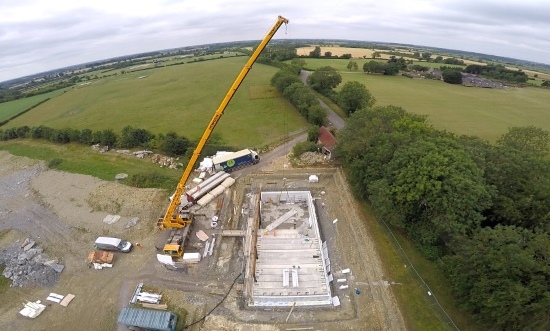 The experience Jake has had of using the insulated concrete formwork is that there is a lag in the heat being re-emitted and thus the benefits from it last longer than the single day. Essentially Jake expects the temperature of the concrete core to remain stable and consistent with the interior temperature of the space. 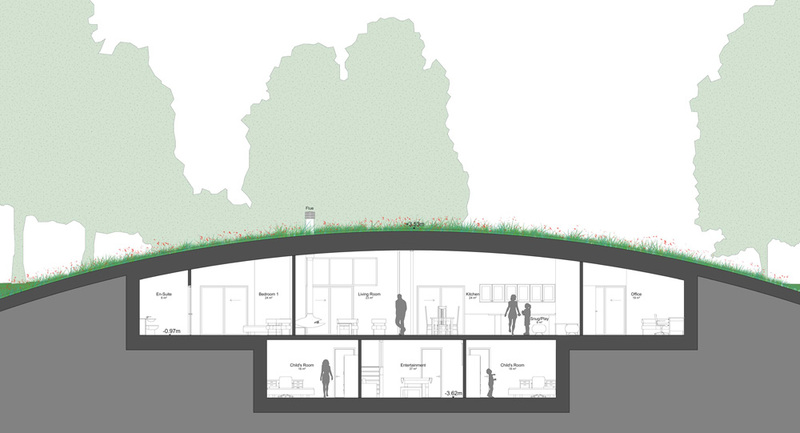 This was certainly the case for the Curly House, which has a beautiful but very exposed site. 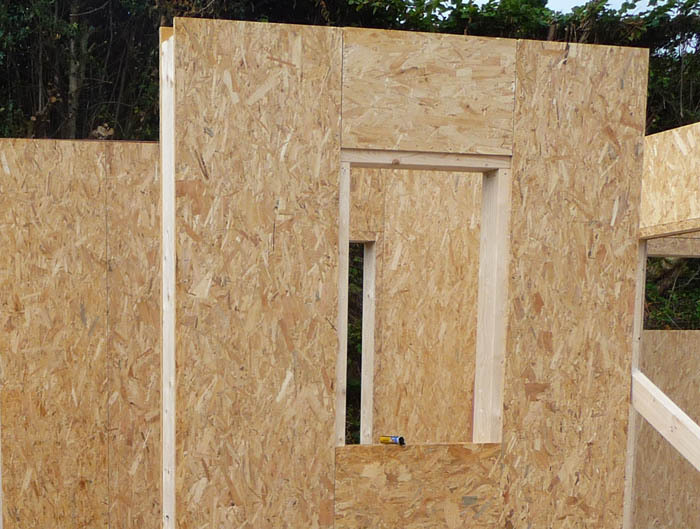 Jake suspects that over time if different construction methods had been used, such as a concrete basement and timber frame, there would have been jarring against each other resulting in the airtightness being compromised. Concrete was deemed to be the ideal material to match the undulating forms of the building with those of the landscape. 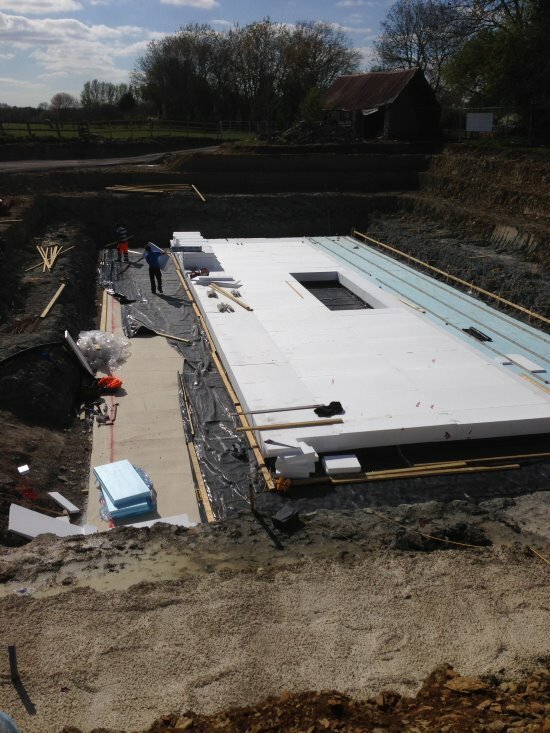 A tanking treatment is used on top of the regular foundations to prevent moisture from rising. 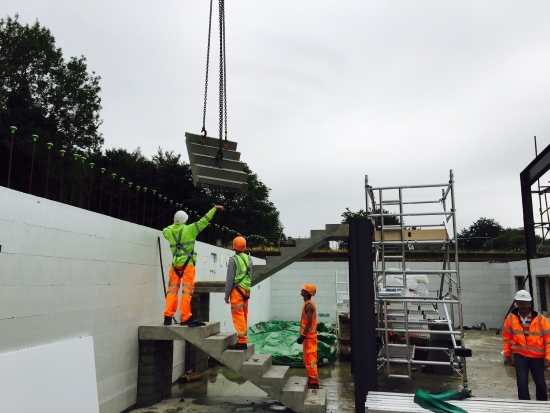 Even within a single project there are different thicknesses of concrete needed, dependent on the load they are retaining. The products are designed so that you only have to use the thickness that is required for the particular task. The absolute minimum width required cannot always be achieved, given the limitations and requirements of the pouring process. 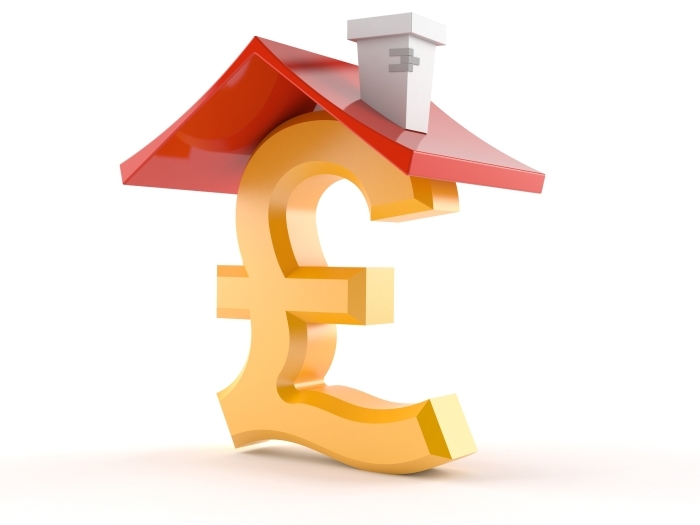 Due to the excellent levels of airtightness almost any interior or exterior finish can be applied. 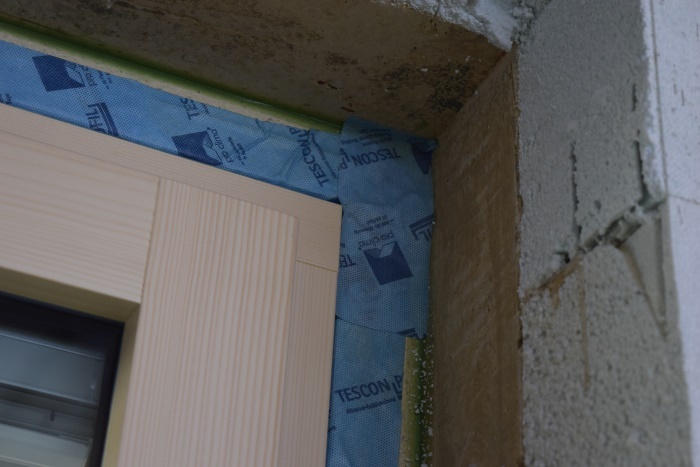 It is one of the rare products which doesn’t need a wet plaster finish on the interior for the purpose of achieving airtightness. 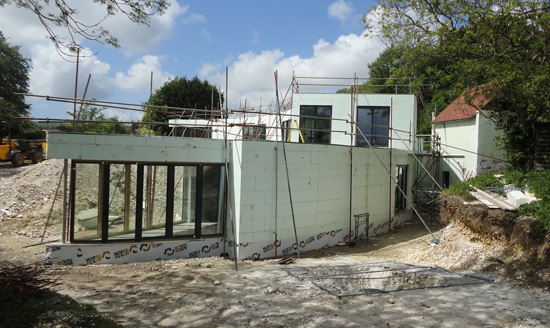 Jake has seen examples of buildings using insulated concrete formwork where, even without trying, adequate levels of airtightness were achieved. With these results almost being realised by accident it wouldn’t take a great deal more effort to achieve the Passivhaus standard. 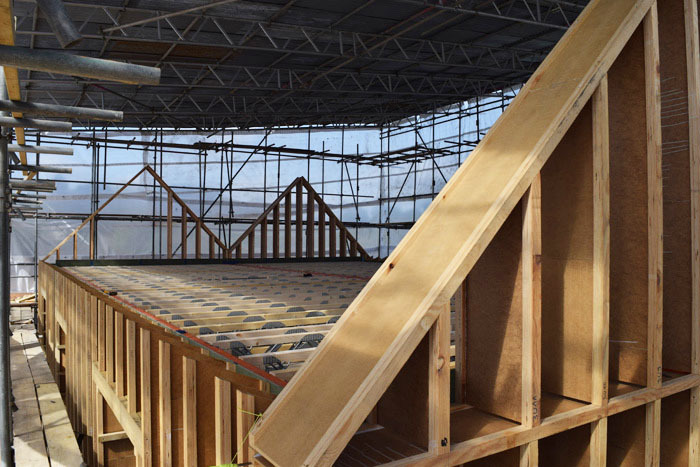 For buildings that have a full insulated concrete formwork, the only areas vulnerable to air leakage are around the windows and doors so tapes and membranes need would need to be used. The Curly House benefited from having a contractor with lots of experience in the systems being used. 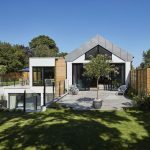 There had been many challenges but the level of attention to detail and capabilities of the contractor resulted in the high quality design being reflected in the construction. Download a transcript of the interview with Jake White.